It seems like the school season just started. However, with the first half of the year almost behind us and the holidays fast approaching, teachers everywhere are busy redecorating their classrooms. With images of turkeys and colorful leaves, snowflakes and bright lights, the holiday spending is in full force. DIY projects are a great way to save money and spend less during the holiday season. MyPrintly offers a plethora of DIY crafts, printables and inspiration, perfect for the classroom or home. We’d love to see your creations! Be sure to share them with us by using the hashtag #MyPrintly on social media. Keep reading for some great classroom hacks that will save you time and money, as well as how you can dress up your classroom for the holidays- and year round, for less! Preserve materials you’ll use multiple times. Shannon Lisowe, from Speechy Musings, laminates useful visuals, pages, and books and stores them in a binder to make it easy to grab and go from year to year. “It’s a little more cost and time upfront, but it will absolutely save you in the long run!” This is especially great for holiday items you only need once a year. Reduce printing costs with a subscription service. Many teachers have printers in their classrooms but very little budget to print. With all the wonderful holiday printables and crafts to make, many teachers end up printing up to 300+ pages per month. Enter HP Instant Ink (i.e. Subscription Service). HP’s Instant Ink program allows subscribers to save time and money by delivering ink cartridges at a fraction of the cost of store-bought ink, right to your door. This program offers a month-to-month subscription and you can cancel anytime. Plans start as low as $2.99/month which can save teachers TONS of money on ink. Extra savings on ink means extra money for your holiday budget! Score! “I do not feel guilty about printing games and activities for my students because I am not having to spend a fortune out of my own pocket!” Chandra Dills, from Teaching with Crayons and Curls. Your compatible HP printer communicates low ink levels to HP so ink is delivered to your door before you run out. “My favorite thing about HP Instant Ink is the fact that not only is the ink inexpensive, but it is shipped to your door so you never have to leave your house!” Lauren Shirk, a K-3 Reading Intervention teacher from A Teachable Teacher. HP Instant Ink also offers great options for teachers who are tired of only printing in black and white to save on costs. Kristin Oldham, from A Teeny Tiny Teacher, loves the aspect of being able to print in color too, for the same price. 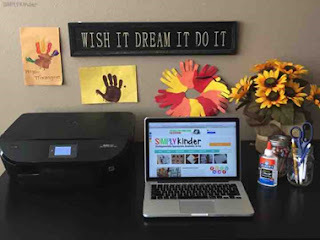 “I love how I don’t have to prioritize what I will print in color or what I will print from home vs. school.” You can learn more about HP Instant Ink by visiting www.hpinstantink.com. Be a smart shopper. 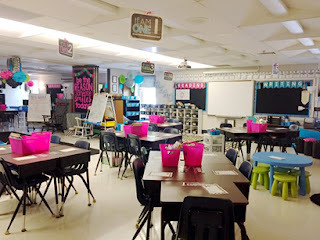 Finding the perfect décor items for your classroom is costly. Cut back on costs by visiting local thrift shops. 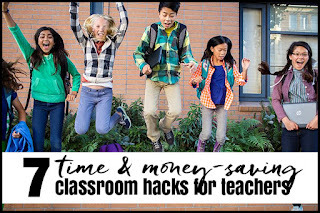 “You’ll be amazed at how many goodies you can find for little to nothing for your classrooms.” Traci Bender, special education teacher for grades 3-5 from The Bender Bunch. Hone your parent-teacher presentation. Teachers like Vanessa Levin from Pre-K Pages, admit that parent-teacher nights can be nerve-wracking. Calm your nerves by planning and anticipating parents’ questions. Also, don’t be afraid to sprinkle in some fun. Parents are nervous too and if you have an icebreaker or specialty décor, it will get the conversation started. Vanessa suggests creating a parent handbook to arm yourself with the answers they are looking for. This way you will appear confident and knowledgeable and parents will be at ease knowing their child is in good hands. Ask for donations. You might be surprised to learn how many of your students’ families have extras around the house that you can use in the classroom. Make a list of all the classroom necessities you might need throughout the year: tissues, hand sanitizer, crayons, glue, etc. and send it home with each student. Sprinkle in some seasonal items so you don’t have to front the money on those too. Even indoor recess activities can be supplied via donations if families have extra puzzles or games sitting around. Curious about HP Instant Ink, the subscription service mentioned above? You should be! To receive one free month of ink, sign up here. Once you try it, we know you’ll love it! After signing up, be sure to share your own Refer-a-Friend link to earn even more free ink!